Thelma Speights Wiggins was born to Jason Speights and Lillie Speights in Linton, Georgia on February 20, 1920. This union was blessed with four children, two boys and 2 girls. Thelma was the second oldest child. Thelma attended public school in Hancock County, Georgia. The church of her youth was Second Doreen Baptist Church. Thelma married the love of her life, Julian E. Wiggins on April 17, 1938. Thelma attended Manual and East High Schools taking courses in general education and supervision. She also attended Emily Griffith Opportunity School taking courses in housekeeping and dressmaking. She completed coursework in cosmetology in 1958 becoming a licensed beauty operator. 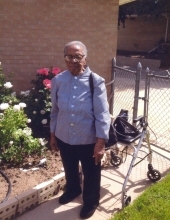 Thelma was primarily a homemaker, however during her life, she worked in housekeeping and cosmetology. Thelma was an avid homemaker. Making draperies, choosing furniture and decorating to beautify her home brought her great joy. Thelma was passionate about gardening. She grew a variety of vegetables and flowers. She especially loved her rose garden and received many compliments about her garden. She was a capable seamstress sewing all her life. She loved coordinating her hats, shoes and dresses getting ready for church. Sewing is a skill she taught her two daughters. Thelma was a Christian. She brought with her, from her native Georgia a rural church experience and always felt that God and church should be a part of her family’s life. She attended New Hope Baptist Church joining in 1946. She brought her children (Sherry, Nathaniel, and Linda) to church where they learned the values of a Christian education by participating in church youth activities. Thelma was always there for her family. Her belief in God family and friends were the important parts of her life. Thelma leaves to mourn her passing, daughters Sherry and Linda, granddaughters Monica (Scott) and Mattlielin (Kelly), grandsons Nathaniel Wiggins, Jr., Scott David II, Jason, Yancy, Liberty, Devon and ijaesin. To send flowers or a remembrance gift to the family of Thelma M. Wiggins, please visit our Tribute Store. "Email Address" would like to share the life celebration of Thelma M. Wiggins. Click on the "link" to go to share a favorite memory or leave a condolence message for the family.